What motivates Sascha? Alexander “Sascha” Zverev is riding high on a Laver Cup victory with his European teammates, where he clinched the title with his win against Kevin Anderson. Ranked 5th in the world, the young 21 year old has already made a name for himself. 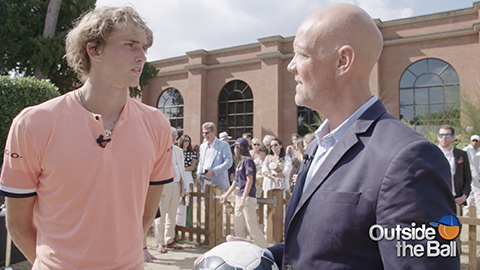 Outside the Ball’s correspondent Murphy Jensen spoke to the tennis star about what inspires him to reach and maintain at the highest level of the sport. “Obviously what inspires me is playing at the biggest tournaments in the world and trying to win them. Trying to compete with the best players in the world, and that’s what I’ve been doing the last two years.” Zverev began as he expressed his goal to one day win a Grand Slam. In 2018, the German’s season included his third Masters 1000 title in Madrid and reaching his first Grand Slam quarterfinal at Roland Garros. “I want to win them [Grand Slams] at some point in my career, so that’s why I do the extra sessions in the gym, that’s why I do the extra sessions on the court to just be able to compete with the best.” He continued. Zverev is currently the youngest ranked competitor inside the Top 10 and isn’t going anywhere. This interview is a heartfelt look inside the mind of one of tennis’ current stars, and hopefully, future Grand Slam champion!